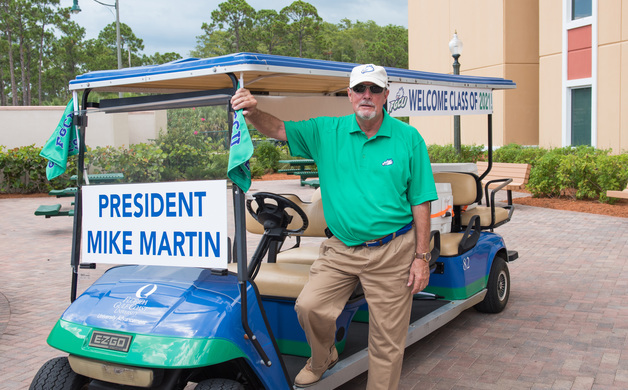 FGCU President Mike Martin in the heart of campus. Photo courtesy of FGCU. FGCU President Mike Martin welcomes a freshman at a campus dorm on move-in day in August 2017 with Director of Housing Brian Fisher. Photo courtesy of FGCU. 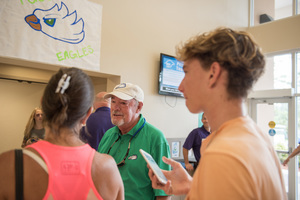 FGCU President Mike Martin greets freshmen at a campus dorm on move-in day in August 2017. Photo courtesy of FGCU. To face the pressing challenges of growth and finances, Florida Gulf Coast University launches its third decade with a new leader who has been there, done that across the country. Michael V. “Mike” Martin, Ph.D., who turns 71 in January, succeeds Wilson Bradshaw. 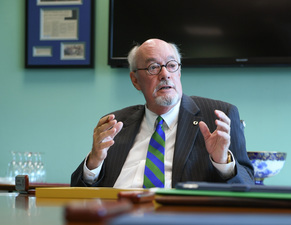 He retired last summer after serving for 10 years as FGCU’s third president. A nationwide search seized on Martin’s know-how from leadership positions at the Colorado State University System, Louisiana State University, University of Florida, University of Minnesota (his native state) and Oregon State University. His areas of specialization include international trade and pricing, public policy, transportation and business logistics. 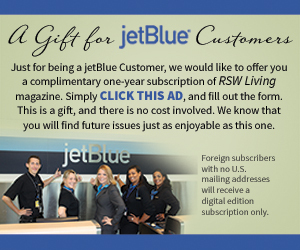 This interview was conducted for Bonita & Estero Magazine by Jeff Lytle. He is the retired editorial page editor of the Naples Daily News and former host of the Naples Daily NewsMakers television show. Lytle had also interviewed FGCU’s previous three presidents. Contact him at jlytle@comcast.net. You did a lot of homework on FGCU and the community before coming here. Since arriving, what has surprised you—what new have you learned? Most surprising to me is how much FGCU and the region around it have grown and advanced in just two decades. The quality of the students, the faculty and the staff is remarkable for such a young university. The community has embraced the university in many significant ways. The outcomes to date could not have been envisioned or predicted by conventional observers. Each of the first three FGCU presidents has had a niche. Roy McTarnaghan was the university system insider and builder; the late Bill Merwin was the fundraiser; Wilson Bradshaw was the grower. What do you consider as your special role? The role I believe I was hired to play is to take FGCU into its next era by continuing to strengthen the academic core, enhancing student success and their transformational experiences and to build on the established relationships in the region so as to serve citizens as well as students. Making effective change, it seems, is central to my main mission. It is clear you are more than a caretaker president, as evidenced by your strategic administrative changes and resolve to improve the graduation rate. What fuels your passion for that hard work at this stage of your career? Over more than four decades, I’ve had a career much more rewarding than I could have hoped for. Interactions with those in the campus community, especially students, make every day challenging, interesting, rewarding and almost always fun. It is addictive and even at my age I remain an addict. How do you explain to the layman why it is so hard to graduate in four years? Time was, that was the norm. Is it because today’s undergraduate is more likely to be older and/or have work and family roles to juggle? Many of our students face unique challenges which make completing in four years difficult. They often face financial constraints which require that they work. Many are first-generation college attendees who have to learn to navigate a college career with little help from home. Some, though smart, have deficiencies in their college readiness which means they need a bit of additional time to catch up. And, quite honestly, a few so enjoy college they are reluctant to leave. Still, in every case we intend to support them in every way so they can succeed and succeed in minimal time. Creating flexible pathways to degree completion, minimize student debt and accelerate joining the workforce will be central in our commitment to every FGCU student. 5. How do you summarize FGCU’s place in the overall state university system? Should that change over time? FGCU is and should remain a comprehensive, regional university in a broad-based, 12-institution system. While earning national, indeed international, recognition FGCU should never forget its responsibility to serve the state and most certainly the Southwest Florida region. This involves, and will continue to involve, educating students who can find a career in Florida, serving citizens—current and future—and engaging communities. Many people in the community knew your predecessors. Do you plan to get out into the community to meet and greet as they did? Yes, I have already begun to introduce myself to many local leaders and the region’s citizens. This will continue to be central as I listen to those we serve so as to serve them better. 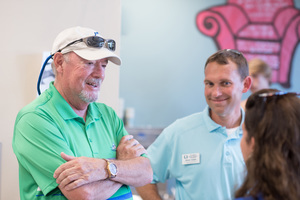 How do you sum up the level of community and philanthropic support for FGCU? To date the level of philanthropy from the local citizen-boosters has been remarkable. With a rather small, young alumni base we have to rely on those who have adopted FGCU as their university. Many have generously done so. Still, we will continue to seek out those who wish to make an investment that will transform lives and create a powerful legacy. In an era when costs of higher education are under the microscope, what is the right mix for fees versus the highest-possible quality? Certainly quality comes at a price and those we attract and serve understand this. Both students and the state must support our ongoing journey to excellence. Sometimes fees to provide students with what they need are necessary. At the same time, those of us who lead FGCU must be able and willing to ensure that every dollar, from whatever source, has maximum impact. We will not compromise on quality so this sometimes means focusing on those things we can and must do well and let others provide programs that don’t meet this FGCU standard. On a scale from 1 to 10, where does football rank in your priorities? Right now football would rank for me as a 2. Perhaps someday football will be feasible at FGCU but it isn’t now. We will, however, compete at the highest level in the sports we sponsor. Our student-athletes will represent FGCU with distinction. 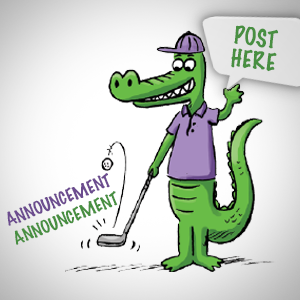 What should the public know about FGCU that it may not already know? FGCU is a community of scholars—students, faculty, alumni and friends—who are committed to learning and serving others. They are supported in every way by dedicated, talented staff professionals. These folks bring a passion for what they do that transcends just doing their job; it’s a calling. I’m extremely proud to be their colleague. Interview conducted by Jeff Lytle.